Rain likely before 5pm, then rain and snow. High near 45. North northeast wind 10 to 15 mph becoming east southeast in the morning. Chance of precipitation is 80%. Little or no snow accumulation expected. Rain and snow, becoming all snow after 8pm. Low around 29. North wind around 10 mph. Chance of precipitation is 100%. 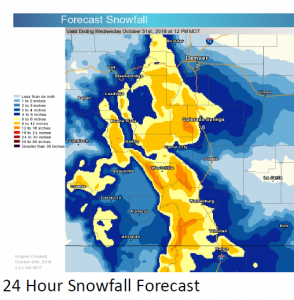 New snow accumulation of 3 to 5 inches possible.